This initiative aims to build and support community gardens across Canada so deserving communities can get closer to real, fresh food. Through this initiative over $100,000 has been contributed to Evergreen’s Seeding Healthy Communities program to help build and support urban gardens across Canada. 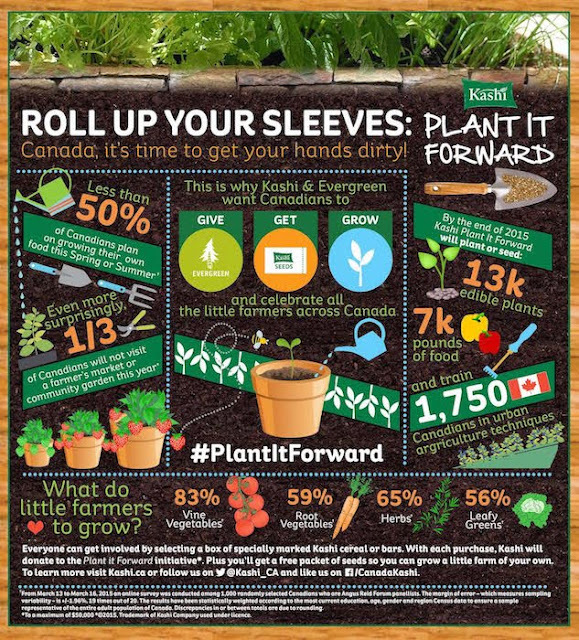 Specially marked boxes of Kashi cereal and bars will have organic vegetable seeds, so Canadians can easily get involved and grow something delicious this gardening season. Whether it is a backyard garden or potted plants on your condo balcony, there are opportunities for all of us to be little farmers or support those that get their hands dirty. Gardens are very important for our health, these green spaces in urban areas are very important for us to not only foster community ties, but also offer children and youth a space to connect and learn about good food habits from an early age. 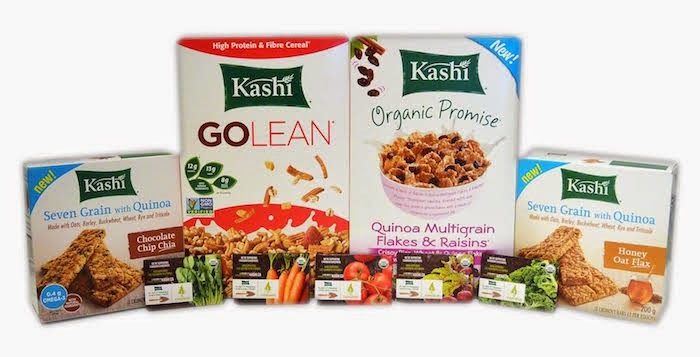 Everyone can join the Plant It Forward mission by picking up a box of specially marked Kashi cereal or bars in their local grocery store. With each purchase, Kashi will donate to the Plant it Forward initiative, up to a maximum of $50,000. In addition, consumers will also receive a free packet of organic seeds such as carrots, spinach, beets, kale and tomatoes, so they too can grow a little farm of their own at home. To get you started, I am hosting a giveaway for one person in Canada to win a Kashi prize pack before May 25th by entering the giveaway through the rafflecopter below. Please leave your comments and follow my social media networks to be eligible to win. I'm in BC and I do enjoy gardening. I live in Toronto, Canada, and I love gardening although I am still a beginner. Ontario - And sure do enjoy gardening! I live in Ontario and yes, I love gardening! I am from BC and I like to garden. I'm actually not very good at gardening. My sister has the green thumb! I live in Port Coquitlam, just outside of Vancouver in BC. I enjoy gardening, but always seem to have a hard time starting. I am in Ontario. I like gardening, but am not too good at it. I'm in BC. I don't mind the gardening, but my mom loves gardening and I help out when I can! From NB. I do not like gardening. BC and I have green thumbs, love to garden! I live in Ontario and I love gardening! I'm in Alberta and am an avid gardener! I live in BC and i enjoy having fresh vegetables in my yard. I live in Saskatchewan. I don't like gardening. I live in Ontario and love gardening, especially food! I live in Ontario. I've never done any gardening, but I'd love to - just as soon as we move into an apartment with a little dirt or sunshine ;). I think it's something everyone should do or at least give a try if they can. I live in Ontario and enjoy gardening. I am in Ontario. I love gardening. I find it very relaxing and have been doing this for a couple of years. So, I am new to this. I live in Newfoundland. I like to garden, but I am not very good at it. I live in Newfoundland. My husband does some gardening. I enjoy eating it. I absolutely love gardening...I do it every year. I live in Ontario and I do love gardening. I live in NB and we have two big gardens that my hubby and I tend to. I live in BC and I love to garden. I spent yesterday helping my mom plant her garden and I'm finishing planting mine this weekend. My flower bed was planted last weekend, which means I need to weed today probably. I'm in NB and I love gardening, all except for the bugs. I live in Newfoundland and I love gardening. I live in Canada. I do enjoy gardening, wish I had more time. I live in BC. I do enjoy gardening but I wish I had a bigger yard so I could do more. I live in alberta and love to grow my own food. I live in Ontario and gardening is okay. I live in PEI and I do very little gardening but am planning to do more this summer! I am from Ontario and I don't enjoy gardening. I live in Ontario and gardening is my favourite thing to do! I love all aspects of it. Just finished preparing my garden yesterday. Hope to plant tomorrow (too hot today). I started a bunch of seeds indoors this year (with the help of The Kids) so that was fun. I'm hypoglycemic and always have a Kashi bar in my purse as my go-to snack. They're the lowest in sugar that I've found and they taste AMAZING! I live in Ontario and gardening is alright but like someone else to do it. I live in Alberta. I enjoy gardening but right now all I have is a flower bed, not a good sized garden to work in. I am in MB and I love to garden! I live in Ontario, I do enjoy gardening, but am not very good at it. From ON, doing first container garden this year.